If you love the cruelty and realism of A Game of Thrones by George R. R. Martin then this is the book you need! A dark fantasy series which is full of demons and necromancy by Lina J. Potter, author of the bestselling Medieval Tale. A betrayed princess sacrifices herself to get vengeance for her ruined mind and life. A newborn prince will become the ultimate weapon for her bloody revenge. He is a half-demon necromancer who was born for an express purpose: become strong, destroy their enemies and regain the throne. Prince Alexander Leonard Radenor is starting his journey, along the way, he will have to master his skills and try to avoid losing himself in the process. After all, there is a reason why necromancy is considered the forbidden art: there is a thin line between using them and letting them use you. Still armed with his magical prowess, martial skills and the abilities granted to him by his demonic heritage, Alex presents a serious threat, the one that the royal family and the court would do well to fear. 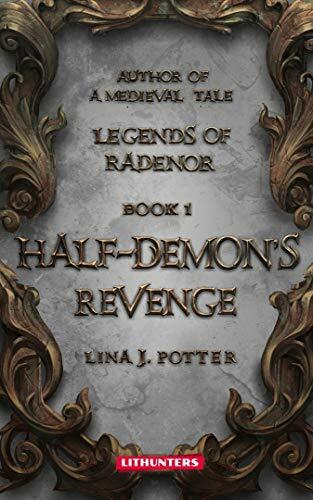 Half-Demon is the first book in The Legends of Radenor series by Lina J. Potter, the author of the bestselling A Medieval Tale series. A brand new but totally different story set in a new world, on the wide lands of a fairy kingdom. The land of Radenor is in need of salvation: the royal family and court are corrupt to their very core and full of vipers and backstabbers, the church is malevolent, people are starving, death has become a frequent guest of the mendicant people.